The Millennium Tower is a luxury skyscraper in San Francisco. It has been sinking and tilting since it’s construction 8 years ago. In fact, the 58 story building has sunk 8 inches, and tilted at least 2 inches. San Francisco is experiencing a building boom, and planners and politicians want to know why the Millennium Tower is having these problems. Now they’re getting a little help from space. 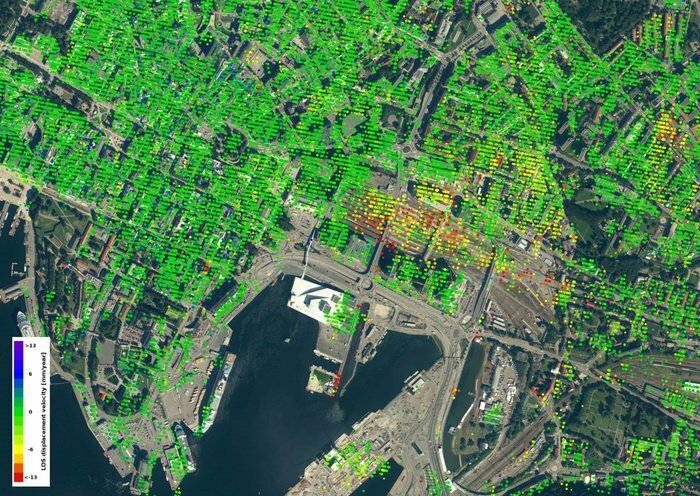 The European Space Agency’s (ESA) Copernicus Sentinel-1 satellites have trained their radar on San Francisco. They’ve found that the Millennium Tower is sinking, or subsiding, at the alarming rate of almost 50 mm per year. Although the exact cause is not yet known for sure, it’s suspected that the building’s supporting piles are not resting on solid bedrock. The Sentinel-1 satellites are part of the ESA’s Copernicus Program. There are two of the satellites in operation, and two more are on the way. They employ Synthetic Aperture Radar to provide continuous imagery during the day, during the night, and through any kind of weather. Though the Sentinels were not specifically designed to monitor buildings, they’re actually pretty good at it. Buildings like the Millennium Tower are especially good at reflecting radar. When multiple passes are made with the satellites, they provide a very accurate measurement of ground subsidence. The Millennium Tower is not the only thing in San Francisco Bay Area that Sentinel-1 can see moving. It’s also spotted movement in buildings along the Hayward Fault, an area prone to earthquakes, and the sinking of reclaimed land in San Rafael Bay. It’s also spotted some rising land near the city of Pleasanton. The recent replenishing of groundwater is thought to be the cause of the rising land. Now other parts of the world, especially in Europe, are poised to benefit from Sentinel-1’s newfound prowess at reading the ground. In Oslo, Norway, the train station is built on reclaimed land. Newer buildings have proper foundations right on solid bedrock, but the older parts of the station are experiencing severe subsidence. As for the Millennium Tower in San Francisco, the problems continue. The developer of the building is blaming the problems on the construction of a new transit center for the city. But the agency in charge of that, the Transbay Joint Powers Authority, denies that they are at fault. They blame the developer’s poor structural design, saying that it’s not properly built on bedrock. Now, the whole thing is before the courts. A $500 million class-action lawsuit has been filed on behalf of the residents, against the developer, the transit authority, and other parties. It’s a good bet that data from the Sentinel satellites will be part of the evidence in that lawsuit. – This was the deadliest quake ever recorded. It claimed the lives of about 830,000 people. At that time, most inhabitants in the affected areas were living in Yaodongs or artificial caves. They were buried alive when the huge tremors caused the cliffs in which these caves were located in, to collapse. – Although its tremors were also felt in Southern Oregon, it is the resulting fire in San Francisco that had a more devastating impact on the economy. Is has been often compared recently to Hurricane Katrina because of its similar economic bearing. – Like the one that hit Asia in 2004, this 9.5-rated quake resulted in a massive tsunami reaching up to as high as 10.7 meters. This magnitude is the highest recorded ever. Although the tsunami originated in Cañete, Chile, the waves raced north-westward to Japan and the Philippines, wreaking havoc there. – With a magnitude of 9.2, it is the second strongest earthquake to be ever recorded. It caused tsunamis, landslides, and resulted in major landscape changes. Some places near Kodiak is said to have been raised 9.1 meters high, while those near Portage were dropped by 2.4 meters. Here are more articles about Alaska earthquakes. – This is the deadliest quake of the 20th Century, with the number of deaths hitting somewhere near 250,000. Weak building structures and the time this disaster struck (4 am) contributed a lot to that sickening number. – The death toll in this tremor reached over 26,000. Like the one in Tangshan, the use of poor construction materials was one of the leading culprits for the deaths. Most of the affected buildings were made of mud bricks. – The resulting tsunami that killed 230,000 people was caused by a subduction between the India and Burma plate. Its 30 m-high waves destroyed virtually everything in its path, making this quake not only one of the most famous earthquakes but also one of the famous natural disasters in history. Excluding poor building infrastructure, we can see that high death tolls in these famous earthquakes result when the tremors are accompanied by tsunamis. This happens when the quake’s epicenter is found at the bottom of the ocean.